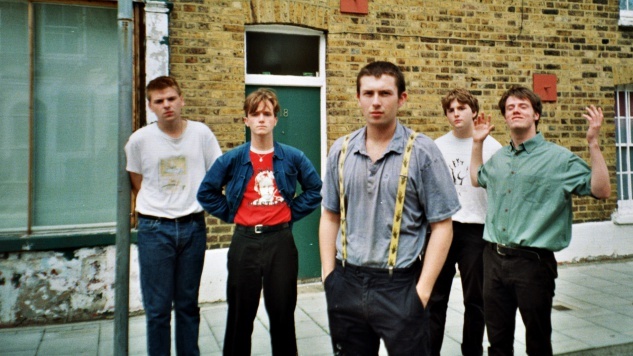 Shame Reveal Creepy New Video for "Dust On Trial"
Earlier this week, Paste shared our list of the best albums of 2018, ranking Shame’s Songs of Praise at number 12. In our full review of the album, Madison Desler wrote, “Shame make familiar but not unawesome post-punk. Think tightly wound, jittery guitars, mile-a-minute hi-hat and an exquisite bleakness that stems from their municipal origin.” Paste also caught Shame’s storming set at Austin City Limits this year, complete with frontman Charlie Steen’s trademark lurking, stomping and sweaty grin, and bassist Josh Finerty’s various unhinged acrobatics. The band’s video for “Dust On Trial” reads like a slasher film, though it stops short of showing us the implied ominous conclusion, and we have a lot of questions. It follows a couple’s drive into the country—there’s something a bit off about the girlfriend as she takes a strange liking to knives and has a suspiciously calculated look in her eye. They hear a noise and a glowing light coming from the barn, and she appears to get dragged inside as the boyfriend runs away. Was she trying to trying to lure him in, but failed to do so? Was she planning to kill him via other means and was instead thwarted by whatever entity pulled her into the barn? What’s the resulting fate of these two characters? We’re not quite sure, so we’re just left to our own fears and imaginations, and with a grumbling, driving punk tune from Steen and company. The band also revealed their last few U.S. dates in support of their debut album. Next May, they will make an appearance at Alabama’s Hangout Festival and will play some headlining shows in Atlanta, Carrboro, N.C., Washington D.C. and Philadelphia. Watch the video for “Dust On Trial” (dir. BISON) below and revisit our March interview with the band here.